A property is an attribute of a LiveCode object. Each type of object has many built-in properties, which affect the object's appearance or behavior. You can also define custom properties for any object, and use them to store any kind of data. Create a new stack, name it 'Properties' and add a scrolling field and a button. Drag the field out to fill most of the area. You can also open the Property Inspector from the Object menu or by right clicking the object and selecting Object Inspector from the menu or by double clicking on the field. The first pane that you see is the 'Basic Properties'. 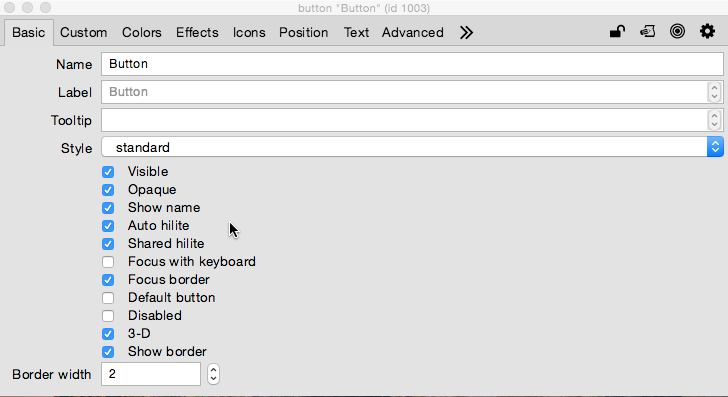 This is where you can change properties such as visibility, whether an object is disabled, border size etc. The properties that are available depend on the object type, this is a field so properties such as 'Don't wrap' can be set. 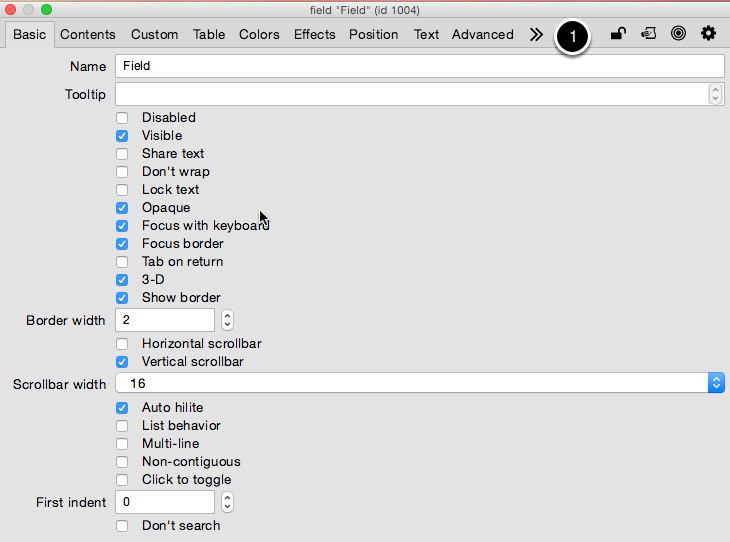 Try changing some properties, toggling visibility, switching off scrollbars etc. Additional properties can be accessed by selecting different options in the tabs along the top. Notice that there is a >> showing that there are more panes than we can see (1). 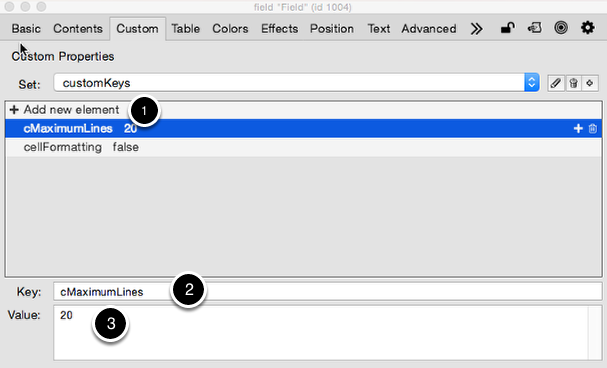 You can set any property of an object using the Property Inspector: text size, font, background color, width, visibility, graphic effects. Play around with some of the properties and see what you can do. Now select the button, if the Property Inspector is open it changes to display the properties of the button. If the Property Inspector is not on screen open it. As mentioned in the previous step some properties are object specific. 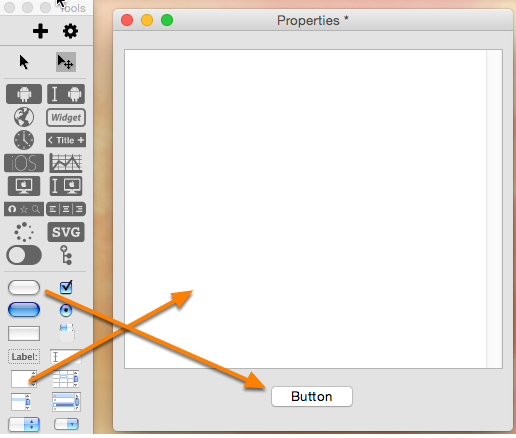 The 'Basic Properties' pane for the button has some properties that are the same as those of fields, visibility, opacity etc but also has properties that only apply to buttons, such as whether it is a default button. The Property Inspector always display the properties for the selected object. 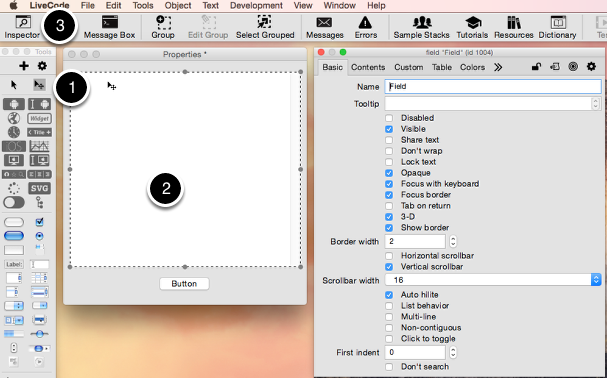 If multiple objects of different types are selected only the common properties, such as width or height are shown. is the equivalent of ticking the Visible option in the Property Inspector for the field. Property labels are: Name of LiveCode property. You can retrieve the value of a property using the get or put commands. You can put the value into a variable or use it directly. Most properties are specific to the object they are part of, and affect only that object. However, some properties of an object, such as its color and text font, take on the settings of the object above it in the object hierarchy. For example, if a field's foreground(text) color property is not specified the field takes on the foreground color of the card that owns it. If no foreground color is specified for the card either, the stack's foreground color is used, and so on. This means you can set a foreground color for a stack, and every object in it automatically uses that color, without your having to set it for each object. This process of first checking the object, then the object's owner, then the object that owns that object, and so on, is called inheritance of properties. Each object inherits the text color of the object above it in the hierarchy. A custom property is a property that you create for an object, in addition to its built-in properties. You can define custom properties for any object, and use them to store any kind of data. You can create as many custom properties for an object as you want. You can create custom properties in the Property Inspector or in script. To create a custom property in the Property Inspector select the object and open the Property Inspector. Select 'Custom Properties' from the drop down menu(1). Then click the 'New Custom Property' button(2) to create a new custom property, name it and then set the value (3). You can create a custom property in script by setting the new property to a value. 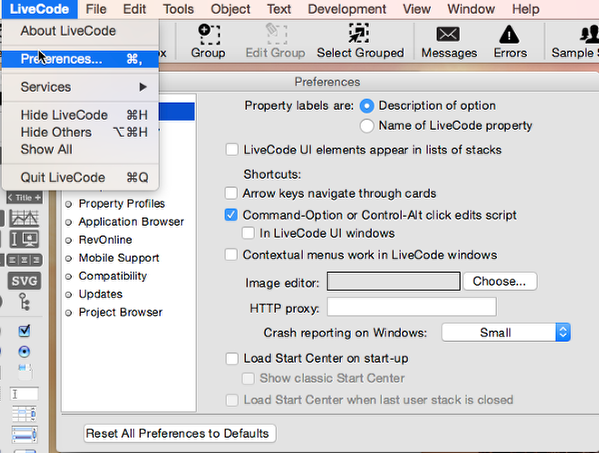 If you set a custom property that doesn't exist, LiveCode automatically creates the custom property and sets it to the requested value. You get and set the value of a custom property in the same way as a built in property.